Top French landscape and portrait artist Camille Corot started late in his career as a painter. Born into a bourgeois family on July 16, 1796, he first worked in their family business together with his father. Camille Corot, who never lacked for anything received a scholarship and entered the Lycée Pierre-Corneille. He was not that brilliant and did not display much of an artistic talent. Corot actually did not have that much interest in art while in school. He soon left the Lycée and went to boarding school. Corot was shy and awkward when in the company of other people and spent most of his time in the company of his father’s friend with whom he lived for a time. 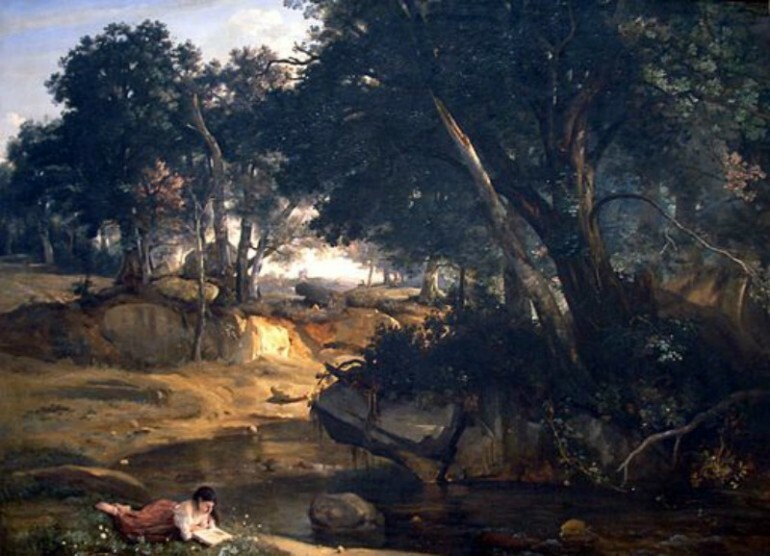 They spent hours on nature walks which somehow impelled young Corot to paint landscapes. Camille Corot may have lacked intensive training in art but he was an excellent portrait and landscape artist and was also adept at etching. He was a very important figure in landscape painting, with his works concurrently referencing Neo-Classicism and the emergence of the outdoor painting methods of Impressionism. His apprenticeship to a draper helped him greatly as well, as it gave him the right aesthetic sense regarding fabric textures and colors. In 1822, at the age of 26, Corot received an annual allowance from his father, and he was able to rent a studio, buy art materials and travel whenever he wished throughout his life. 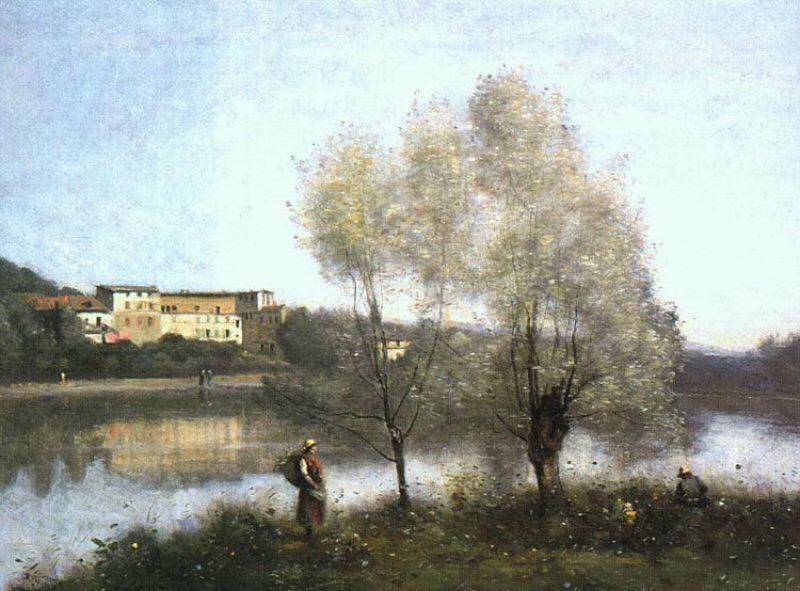 At the time that Camille Corot decided to establish an art career was the time that landscape painting was on the rise. It was divided into realistic landscape that was prevalent in Northern Europe, which faithfully depicted actual flora, architecture and topography, often including peasants going about their daily lives. The other was the historical landscape favored by Southern Europe Neoclassicists, which represented imagined and real views with Biblical, mythological and ancient figures populating the canvas. These two groups typically started with sketching and preliminary painting outdoors but the final touches were done in the studio. Landscape artists that were highly influential among the French landscape painters of the 19th century were Englishmen J. M. W. Turner and John Constable, both of whom favor Realism. Although only for a brief period, Corot took lessons from landscape painter Achille Etna Michallon, who exerted quite an influence in his career. Michallon taught Corot to do outdoor landscape sketching and painting, copying 3D forms and tracing lithographs and showed him various works done in the tradition of French Neoclassicism, which, although already on the decline, was still favored by the Salon. And while Corot had so much exposure in Neoclassic style, he was not one to conform to it. He painted with precision, following the teaching of Michallon, who told him to scrupulously render all the things that he saw, which was more the style of the Northern realists. Instead of taking inspiration from the great Italian Renaissance masters, Corot was greatly drawn to the Italian countryside. The Farnese Gardens became one of his favorite sites for his paintings, often painting one spot at different times of the day. On his own he learned to understand how to effectively place buildings in a natural setting and give rocks and man-made structures solidity and volume with the right combination of light and shadow. Unlike the Impressionists that applied pure colors with short strokes to achieve light and shade, Corot’s technique was to apply colors thinly and smoothly. While many critics admired his en plein air paintings which to them were the seeds of Impressionism, it was still decades away from the actual birth of said movement. He came to Barbizon in 1829 to paint scenes from the Fontainebleau forest. He returned to the area in 1830 and 1831, intending to paint something to submit to the Salon. While there he met a few members of the Barbizon school including Charles-François Daubigny, Jean-François Millet, Constant Troyon, Paul Huet and Théodore Rousseau. He was not still successful in conquering the appreciation of the Salon jurors. In 1847 Eugène Delacroix said that Corot was a true artist and artist Constant Dutilleux bought a Corot painting at the recommendation of Delacroix. Their friendship resulted in Corot developing friendships with artists and patrons. Corot became a Salon jury in 1848 and in 1867 earned the right to be promoted as a Salon officer. Camille Corot had a very productive career, producing more than 3,000 paintings. When asked about his approach to art in 1860, Camille Corot replied that he interpret with his eye as much as with his art.